With growing competition, it has become very essential for the companies to keep a track of customers’ requirements and deliver products and services accordingly. This provides them with the opportunity to get more leads and convert those into clients. Oracle’s PeopleSoft CRM is designed for this purpose as it automates this type of data collection process from different sources and allows viewing and carrying out multiple evaluations of the data. CRM can be used in marketing, sales and service operations in an organization. Oracle PeopleSoft CRM comes in different modules that can be either used independently or can be made to work together. Oracle PeopleSoft CRM Solutions consists of different modules like CRM Analytics and separate Marketing, Sales and Service Solutions. Marketing and Sales Solutions: Marketing and Sales Solutions is used to keep tab of customer records which include leads stage; closing of sales and examining the customer’s purchasing trends and preferences. Each module can be automated which will help to understand the preference of customers purchases. PeopleSoft CRM Solutions also contains Service Module which includes Call Management, Helpdesk and Support Services. PeopleSoft Enterprise CRM also comprises of a CRM Portal Pack which is an integrated platform for information access and communication for employees and customers. 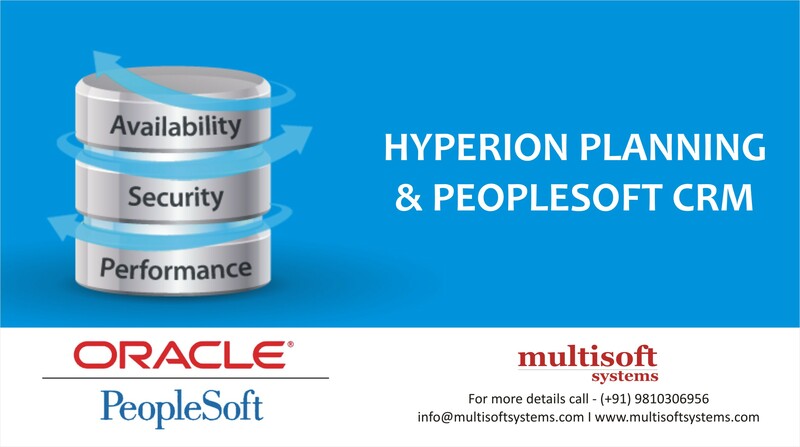 Organizations can use PeopleSoft CRM with Oracle ERP solutions together, as they synchronize with each other neatly and help to enhance productivity. For getting a complete understanding of PeopleSoft CRM Solutions, it would be helpful for professionals if they enroll for training on Peoplesoft CRM Solutions from reliable oracle training in Noida. 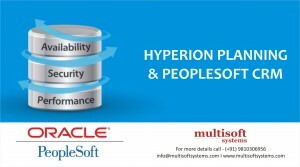 Multisoft Systems is a well-known and established organization which is considered as the best Oracle training center. Reason – it implements the best practical training practices for Oracle related products with an emphasis on real time implementation. Multisoft Systems is the only training organization in the NCR which provides training of even modules as per the candidate’s requirements. Multisoft Systems is an authorized Partner of Oracle University and thus it has been granted the tag of authorized training center for conducting training on various Oracle related products. Oracle Certified Corporate Professionals, with enormous real-time implementation experience, provide training to the professionals. Focus on training of PeopleSoft CRM with Oracle ERP is also given. Customized batch as per candidate’s convenience. Oracle University Official Course Material is provided to the candidates so that they understand leads stage; closing of sales and examining the customer’s purchasing trends and preferences, and many more. Holds feedback sessions with doubt solving sessions which helps professionals to strengthen their fundamentals on use of PeopleSoft CRM Solutions. Thousands of candidates have got placed in top MNCs and Fortune 500 companies. What are the basic skills that employers want in a Core Java Developer?